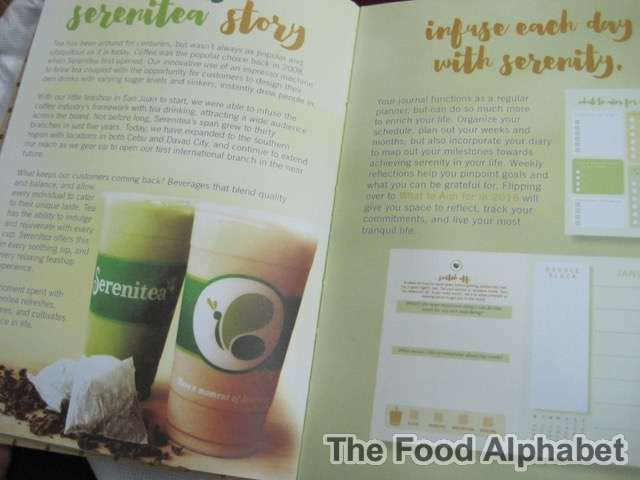 The Food Alphabet and More: Happy 7th Anniversary Serenitea! Jumbo cups are here! 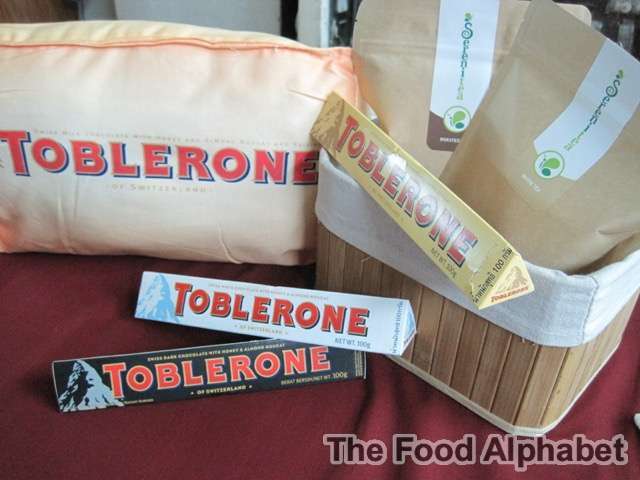 Plus Serenitea Christmas Toblerone specials, A Serenitea 2016 Diary + A Giveaway! Discover also a myriad of chocolate themed drinks that will surely make Christmas memorable. Introducing Serenitea’s Choco Holiday Series made in partnership with Toblerone. Treat yourself and loved ones with our Cranberry Bliss with White Chocolate, White Chaffe Mocha with Milk Chocolate and the bestseller Chocolate Dream with Dark Chocolate for only Php 185.00. These Toblerone drinks are available from until December 2015. Serenitea launches its first planner for 2016 because we want to be a part of your life's greatest moment in the coming new year. Jot down your thoughts and plan for a brand new you. Make 2016 the best year ever by getting the Serenitea 2016 Planner for free by spending a minimum single receipt worth Php1,200 which includes gift certificate purchases you can use without expiration in any branch. Available in all branches from October 25,2015 to January 15,2016. 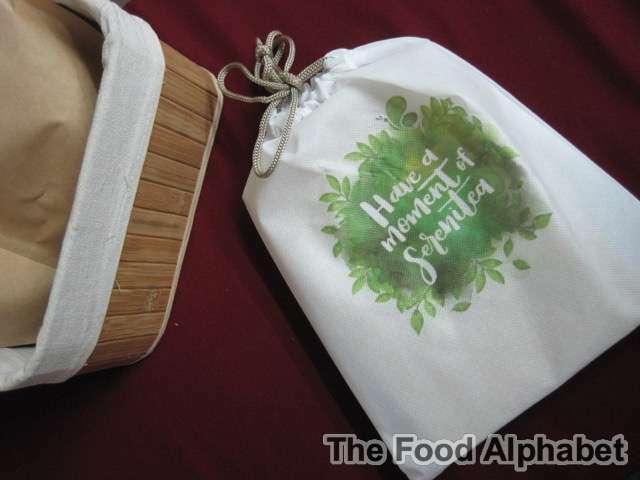 The first ever 2016 Serenitea Diary, packs a lot of jotting to do, from daily and weekly postings to monthly schedules. Plus loads of freebies and discounts for the whole year! Go Serenitea 2016 Diary! 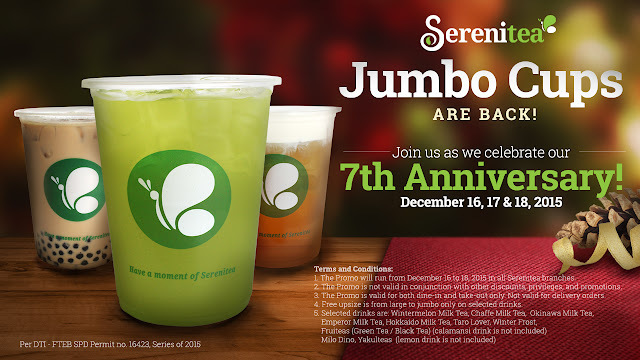 And finally, what is Christmas without our annual JUMBO CUP promo as we celebrate our 7th year anniversary!!! 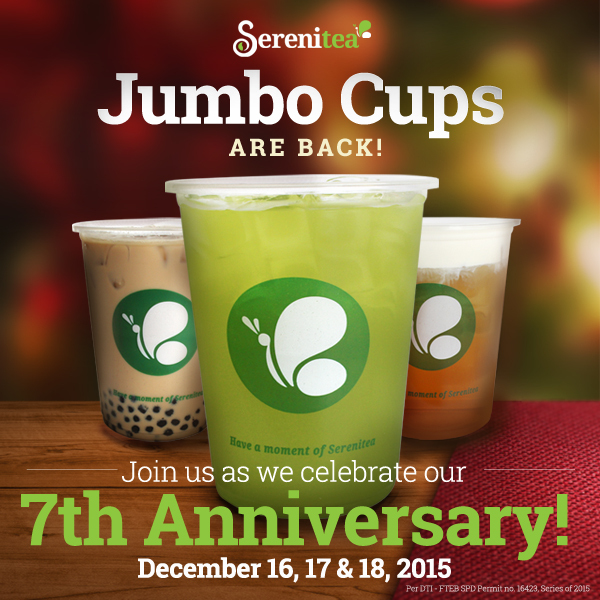 Go JUMBO cup on our bestseller drinks for three days starting in December 16 to 18,2015! It's our way of showing our liter of love for you this Serenitea-filled Christmas in 2015! 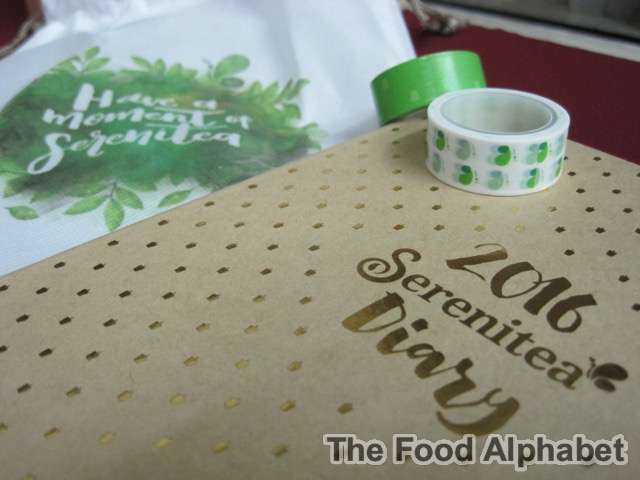 Here we go with A Serenitea 2016 Diary Giveaway! I will use the Planner to schedule my day to day activities and also to use the discount coupons to purchase drinks from Serenitea! I need the planner for my daily activities. I also want to enjoy the coupons and freebies. To replace my old planner. New pointers, activities and new daily routines to jut down. 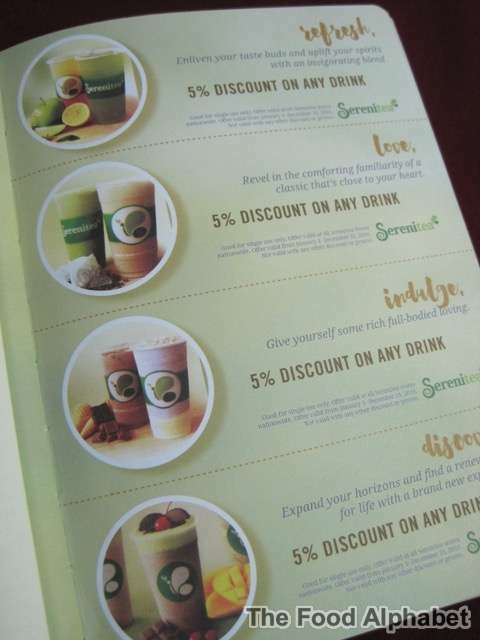 I need a new planner, and I want the coupons to enjoy more Serenitea drinks! I need that discount coupons!!!! I need Serenitea 2016 Planner,a perfect present for my sister,who is an loyal fan of serenitea. teresa hundana @teresahundana, best gift for my son. I need this in order for me to be organized in our trips and activities. I am more into writing it on a planner rather relying on my mobile phone. Fan of green tea slush and uji pyramid, as a student i need something like this and it will be a bonus if it comes from my favorite milktea shop Serenitea. I need Serenitea's 2016 Diary because i need a planner that reminds of all my activity and all special occassion.. and I'm also mom on the go..
With serenitea's 2016 diary I can list all my activities and favorite dates for upcoming year while enjoying all the coupons and sip my favorite serenitea's beverages. I want to try something new and i think SereniTea Diary is a must try. I love the color and the art. This Serenitea Diary will surely help me plan my 2016. It will help me to remember important events/birthdays in office and family. i need serenitea diary because m an oc person and i want everything to be organized and jot down to the last detail so i may not forget. I don't need to be too extravagant with my desires. I think sheer sincerity will win the bout. I just wanted to say that by winning a Serenitea diary, I will not only get a tool in setting my goals for the next year (which is fast approaching by the way) since it also boosts itself up with great freebies that would totally refurbish the way I enjoy every stint in this humble place! This diary is more than just a mere ruled notebook, it will also speak volumes of how much I patronize the store. I'll be honest, I cannot make a P1200.00 single-receipt transaction, but I think that the mere fact that I explore a lot of stuffs in Serenitea says a lot in my knowledge of their great stuffs. I really really need a diary in my life for me to get in touch with myself and have some relaxation while writing. NEW YEAR NEW LIFE IN 2016!